This book provides an essential understanding of statistical concepts necessary for the analysis of genomic and proteomic data using computational techniques. The author presents both basic and advanced topics, focusing on those that are relevant to the computational analysis of large data sets in biology. Chapters begin with a description of a statistical concept and a current example from biomedical research, followed by more detailed presentation, discussion of limitations, and problems. The book starts with an introduction to probability and statistics for genome-wide data, and moves into topics such as clustering, classification, multi-dimensional visualization, experimental design, statistical resampling, and statistical network analysis. Statistical Bioinformatics is an ideal textbook for students in medicine, life sciences, and bioengineering, aimed at researchers who utilize computational tools for the analysis of genomic, proteomic, and many other emerging high-throughput molecular data. 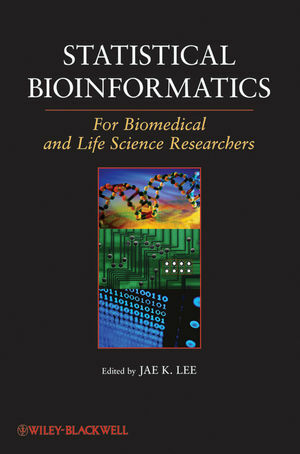 It may also serve as a rapid introduction to the bioinformatics science for statistical and computational students and audiences who have not experienced such analysis tasks before. Jae K. Lee, Ph.D., is a professor of biostatistics and epidemiology in the Department of Health Evaluation Sciences at the University of Virginia School of Medicine, where he designed and teaches a course on Statistical Bioinformatics in Medicine. He earned his doctorate in statistical genetics from the University of Wisconsin, Madison. He was previously a research scientist in the Laboratory of Molecular Pharmacology, National Cancer Institute. Among his current research interests is the integration of statistical and genomic information for the analysis of microarray data. Companion Materials for Statistical Bioinformatics Companion Materials for Chapter 4. Written for biologists rather than statisticians or computer scientists. Utilizes examples throughout to highlight the key concepts. Offers programming examples and datasets. Organized into chapters that guide students from basic to more advanced topics. Emphasizes frequently used statistical approaches. Includes chapter problem sets, glossary, and a list of statistical notations. Enables researchers to successfully evaluate the validity of their results and make inferences. Appendices provide handy reference to background mathematical and technical material. Application to prediction models used in drug discovery and drug outcomes. Useful in translational studies (how the DNA gives instructions...). Supplementary materials, including datasets, links, and statistical package are available on the author’s website.